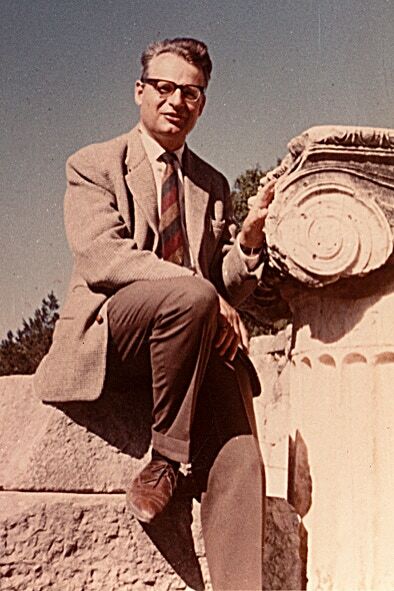 ﻿In ﻿1963 ﻿Klaus ﻿J. ﻿Müller ﻿moved ﻿from ﻿Berlin, ﻿where ﻿he ﻿had ﻿finished ﻿his ﻿dissertation ﻿and ﻿habilitation, ﻿to ﻿Bonn, ﻿where ﻿he ﻿had ﻿received ﻿a ﻿C4 ﻿professorship ﻿of ﻿micropalaeontology ﻿at ﻿the ﻿Institute ﻿of ﻿Palaeontology ﻿of ﻿the ﻿University ﻿of ﻿Bonn. ﻿In ﻿Bonn ﻿he ﻿established ﻿a ﻿research ﻿group ﻿and, ﻿for ﻿a ﻿long ﻿time, ﻿worked ﻿systematically ﻿on ﻿Cambrian ﻿conodonts ﻿and ﻿on ﻿their ﻿inner ﻿fine ﻿structure, ﻿partly ﻿together ﻿with ﻿his ﻿Japanese ﻿colleague, ﻿Prof. ﻿Nogami, ﻿and ﻿undertook ﻿field ﻿trips ﻿to ﻿Sweden ﻿searching ﻿for ﻿microfossils, ﻿e.g. ﻿to ﻿collect ﻿limestone ﻿nodules, ﻿in ﻿Swedish ﻿orstenar, ﻿which ﻿then ﻿were ﻿crushed ﻿to ﻿pieces ﻿and ﻿dissolved ﻿in ﻿a ﻿diluted ﻿acetic ﻿acid. ﻿Already ﻿in ﻿1964, ﻿Klaus ﻿produced ﻿a ﻿long ﻿paper ﻿on ﻿Swedish ﻿Cambrian ﻿bivalved ﻿euarthropod ﻿crustaceans, ﻿called ﻿Phosphatocopina, ﻿but ﻿it ﻿took ﻿until ﻿1975, ﻿when ﻿he ﻿and ﻿his ﻿team ﻿discovered ﻿the ﻿first ﻿fossils ﻿in ﻿an ﻿'Orsten'-type ﻿soft-cuticle ﻿preservation ﻿in ﻿the ﻿etching ﻿residues. ﻿Klaus ﻿immediately ﻿realized ﻿the ﻿importance ﻿of ﻿these ﻿findings ﻿because ﻿of ﻿their ﻿high ﻿quality ﻿of ﻿preservation ﻿and ﻿completeness, ﻿and ﻿because ﻿of ﻿their ﻿high ﻿age. ﻿Using ﻿considerable ﻿personal ﻿and ﻿laboratory ﻿effort ﻿(including ﻿special ﻿microscopes ﻿[Zeiss] ﻿for ﻿sorting), ﻿> ﻿1 ﻿1/2 ﻿tons ﻿of ﻿'Orsten' ﻿limestone ﻿rock ﻿were ﻿dissolved ﻿in ﻿a ﻿specifically ﻿designed ﻿laboratory ﻿in ﻿Bonn. ﻿Within ﻿the ﻿next ﻿years, ﻿the ﻿insoluble ﻿residues ﻿were ﻿picked ﻿by ﻿technical ﻿assistants ﻿and ﻿documented ﻿using ﻿a ﻿scanning ﻿electron ﻿microscope ﻿(the ﻿first ﻿was ﻿the ﻿legendary ﻿Cambridge ﻿S4). ﻿Without ﻿this ﻿extremely ﻿high ﻿effort, ﻿Klaus' ﻿knowledge ﻿of ﻿chemistry, ﻿his ﻿organizational ﻿skills, ﻿and ﻿his ﻿continuous ﻿high ﻿interest, ﻿this ﻿exceptionally ﻿rare ﻿material ﻿would ﻿have ﻿never ﻿been ﻿assembled ﻿in ﻿a ﻿quantity ﻿needed ﻿for ﻿a ﻿thorough ﻿analysis. ﻿Yet, ﻿a ﻿severe ﻿illness ﻿caused ﻿Klaus ﻿to ﻿pause ﻿in ﻿the ﻿late ﻿19seventies. ﻿He ﻿had ﻿to ﻿stay ﻿at ﻿the ﻿hospital ﻿for ﻿quite ﻿some ﻿time, ﻿but ﻿during ﻿this ﻿period, ﻿Klaus ﻿could ﻿rely ﻿on ﻿several ﻿invaluable ﻿and ﻿skilled ﻿assistants, ﻿who ﻿continued ﻿picking ﻿and ﻿sorting ﻿the ﻿material, ﻿putting ﻿specimens ﻿in ﻿micro-slides ﻿or ﻿on ﻿SEM ﻿stubs, ﻿doing ﻿the ﻿SEM ﻿work ﻿and ﻿more. ﻿&squf; ﻿Mrs. ﻿Grossman, ﻿his ﻿secretary, ﻿helping ﻿to ﻿do ﻿the ﻿archiving ﻿and ﻿paper ﻿work. ﻿&squf; ﻿Mrs. ﻿Gossmann, ﻿name-giving ﻿for ﻿one ﻿of ﻿the ﻿pentastomids ﻿(Heymonsicambria ﻿gossmannae), ﻿helped ﻿far ﻿into ﻿the ﻿1990s. ﻿Besides ﻿the ﻿intense ﻿'Orsten' ﻿research, ﻿Klaus ﻿continued ﻿his ﻿work ﻿on ﻿other ﻿phosphatic ﻿microfossils, ﻿mainly ﻿conodonts, ﻿which ﻿culminated ﻿in ﻿a ﻿large ﻿monograph ﻿on ﻿this ﻿taxon ﻿together ﻿with ﻿Ingelore ﻿Hinz-Schallreuter ﻿in ﻿1993, ﻿published ﻿in ﻿Fossils ﻿and ﻿Strata ﻿(for ﻿this ﻿long ﻿pioneering ﻿research ﻿he ﻿received ﻿the ﻿Pander ﻿medal ﻿of ﻿the ﻿Pander ﻿Society ﻿in ﻿2003). ﻿Klaus ﻿also ﻿continued ﻿to ﻿work ﻿on ﻿shelly ﻿fragments, ﻿e.g. ﻿in ﻿material ﻿from ﻿Australia ﻿(named ﻿cambrogeorginids), ﻿which ﻿also ﻿contained ﻿cuticular ﻿elements ﻿and ﻿3D-preserved ﻿trunk ﻿pieces ﻿of ﻿certain ﻿cycloneuralian ﻿nemathelminths, ﻿called ﻿palaeoscolecids. ﻿Papers ﻿on ﻿this ﻿material ﻿were ﻿also ﻿published ﻿in ﻿conjunction ﻿with ﻿Ingelore. ﻿Very ﻿early, ﻿Klaus ﻿realized ﻿that ﻿he ﻿alone ﻿would ﻿not ﻿be ﻿able ﻿to ﻿work ﻿up ﻿these ﻿diverse ﻿fossils, ﻿preserved ﻿in ﻿a ﻿quality ﻿like ﻿"biological ﻿" ﻿material. ﻿At ﻿this ﻿step, ﻿he ﻿had ﻿to ﻿decide ﻿between ﻿putting ﻿more ﻿effort ﻿into ﻿the ﻿search ﻿for ﻿other ﻿'Orsten'-like ﻿occurrences ﻿worldwide ﻿or ﻿investigating ﻿the ﻿'Orsten' ﻿fauna ﻿in ﻿much ﻿depth. ﻿Klaus ﻿decided ﻿in ﻿favour ﻿of ﻿an ﻿in-depth-study ﻿of ﻿the ﻿'Orsten' ﻿fauna ﻿and ﻿to ﻿postpone ﻿further ﻿search ﻿for ﻿similar ﻿'Orsten'-type ﻿faunas. ﻿Searching ﻿for ﻿an ﻿assistant ﻿with ﻿a ﻿biological ﻿background, ﻿he ﻿interviewed ﻿Dieter ﻿Waloszek, ﻿who ﻿was ﻿working ﻿at ﻿the ﻿University ﻿of ﻿Hamburg ﻿on ﻿his ﻿PhD, ﻿and ﻿hired ﻿him. ﻿First ﻿this ﻿was ﻿only ﻿for ﻿a ﻿one-year ﻿project ﻿in ﻿1981 ﻿(paper ﻿on ﻿6 ﻿non-phosphatocopine ﻿Orsten ﻿Crustacea ﻿published ﻿in ﻿1983) ﻿and ﻿then ﻿for ﻿longer. ﻿Starting ﻿as ﻿a ﻿part-time ﻿assistant ﻿in ﻿fall ﻿1982, ﻿Dieter ﻿received ﻿a ﻿full ﻿job, ﻿funded ﻿by ﻿the ﻿Deutsche ﻿Forschungsgemeinschaft ﻿in ﻿Klaus's ﻿team ﻿after ﻿he ﻿had ﻿defended ﻿his ﻿doctoral ﻿thesis ﻿in ﻿March ﻿1983. ﻿Dieter ﻿became ﻿responsible ﻿for ﻿the ﻿entire ﻿study ﻿of ﻿the ﻿fossils ﻿at ﻿the ﻿scanning ﻿electron ﻿microscope ﻿SEM, ﻿illustrations ﻿incl. ﻿reconstructions ﻿and ﻿preparation ﻿of ﻿texts ﻿and ﻿plates ﻿for ﻿the ﻿manuscripts. ﻿At ﻿the ﻿beginning ﻿of ﻿this ﻿period, ﻿Klaus ﻿went ﻿again ﻿to ﻿Sweden ﻿(1981) ﻿to ﻿collect ﻿more ﻿material, ﻿specifically ﻿in ﻿the ﻿Kinnekulle ﻿area ﻿and ﻿the ﻿quarry ﻿Gum, ﻿while ﻿Dieter ﻿went ﻿to ﻿Australia ﻿in ﻿1986 ﻿to ﻿collect ﻿rock ﻿material ﻿in ﻿the ﻿Georgina ﻿Basin ﻿near ﻿Mount ﻿Isa. ﻿Until ﻿1990, ﻿Klaus ﻿and ﻿Dieter ﻿had ﻿published ﻿three ﻿big ﻿monographs ﻿in ﻿Fossils ﻿and ﻿Strata, ﻿the ﻿series ﻿of ﻿the ﻿Royal ﻿Swedish ﻿Academy ﻿of ﻿Sciences ﻿at ﻿that ﻿time, ﻿and ﻿several ﻿shorter ﻿papers ﻿on ﻿'Orsten' ﻿fossils. ﻿Several ﻿were ﻿made ﻿also ﻿in ﻿collaboration ﻿with ﻿colleagues ﻿around ﻿the ﻿globe. ﻿1990 ﻿was ﻿of ﻿significance ﻿also ﻿in ﻿two ﻿other ﻿ways, ﻿the ﻿publication ﻿of ﻿the ﻿first ﻿paper ﻿following ﻿the ﻿method ﻿of ﻿phylogenetic ﻿systematics ﻿(Walossek ﻿& ﻿Müller ﻿1990), ﻿and ﻿the ﻿submission ﻿of ﻿Dieter's ﻿habilitation ﻿thesis. ﻿Habilitation ﻿in ﻿Bonn ﻿was ﻿not ﻿possible, ﻿so ﻿that ﻿Dieter ﻿finished ﻿the ﻿habilitation ﻿in ﻿Hamburg, ﻿where ﻿he ﻿also ﻿studied, ﻿and ﻿received ﻿his ﻿diploma ﻿and ﻿doctor ﻿degrees. ﻿Klaus, ﻿Dieter ﻿and ﻿Andreas ﻿Braun, ﻿in ﻿Bonn ﻿at ﻿that ﻿time, ﻿went ﻿also ﻿to ﻿Moscow ﻿in ﻿1992 ﻿to ﻿receive ﻿a ﻿small ﻿amount ﻿of ﻿rock ﻿material ﻿from ﻿Siberia, ﻿which ﻿unexpectedly ﻿yielded ﻿a ﻿tiny ﻿tardigrade. ﻿In ﻿1993 ﻿Klaus ﻿and ﻿Dieter ﻿underwent ﻿a ﻿trip ﻿to ﻿the ﻿Isle ﻿of ﻿Öland, ﻿Västergötland ﻿and ﻿Östergötland ﻿(Motala). ﻿The ﻿successful ﻿collaboration ﻿continued ﻿not ﻿only ﻿after ﻿Klaus' ﻿emeritation ﻿in ﻿1988, ﻿but ﻿also ﻿after ﻿Dieter ﻿had ﻿finished ﻿his ﻿habilitation ﻿at ﻿the ﻿University ﻿of ﻿Hamburg ﻿and ﻿the ﻿end ﻿of ﻿his ﻿DFG ﻿funding ﻿in ﻿Bonn ﻿in ﻿spring ﻿1994. ﻿In ﻿the ﻿same ﻿year, ﻿Dieter ﻿and ﻿Klaus ﻿published ﻿a ﻿paper ﻿on ﻿the ﻿oldest ﻿parasites ﻿ever ﻿found, ﻿members ﻿of ﻿Pentastomida ﻿(tongue ﻿worms); ﻿an ﻿unexpected ﻿discovery ﻿because ﻿these ﻿worm-like ﻿arthropods ﻿today ﻿live ﻿in ﻿the ﻿lungs ﻿or ﻿related ﻿organs ﻿of ﻿land ﻿vertebrates ﻿(all ﻿living ﻿groups ﻿from ﻿turtles, ﻿snakes, ﻿lizards ﻿and ﻿geckoes ﻿etc., ﻿crocodiles ﻿to ﻿birds ﻿and ﻿also ﻿mammals). ﻿1994 ﻿was ﻿a ﻿big ﻿break, ﻿because ﻿Dieter ﻿received ﻿a ﻿substitute ﻿professorship ﻿in ﻿Kiel ﻿for ﻿one ﻿year. ﻿This ﻿temporary ﻿position ﻿resulted ﻿in ﻿the ﻿successful ﻿application ﻿for ﻿a ﻿permanent ﻿professorship ﻿in ﻿Ulm ﻿– ﻿and ﻿not ﻿in ﻿Hamburg, ﻿as ﻿expected ﻿or ﻿hoped ﻿by ﻿Dieter ﻿because ﻿of ﻿his ﻿northern ﻿German ﻿origin. ﻿&squf; ﻿1993: ﻿Dieter's ﻿habilitation ﻿is ﻿published ﻿as ﻿the ﻿fourth ﻿big ﻿monograph ﻿in ﻿Fossils ﻿and ﻿Strata. ﻿1995 ﻿Dieter ﻿moved ﻿with ﻿his ﻿family ﻿to ﻿Ulm ﻿to ﻿start ﻿a ﻿professor ﻿position ﻿at ﻿the ﻿university ﻿of ﻿Ulm. ﻿Together ﻿with ﻿the ﻿professorship ﻿he ﻿received ﻿the ﻿position ﻿of ﻿a ﻿head ﻿of ﻿the ﻿newly ﻿established ﻿Section ﻿for ﻿Biosystematic ﻿Documentation, ﻿closed ﻿down ﻿in ﻿2006 ﻿by ﻿the ﻿University ﻿due ﻿to ﻿a ﻿so-called ﻿"structural ﻿re-organisation". ﻿That ﻿'Orsten' ﻿research ﻿could ﻿be ﻿taken ﻿over ﻿by ﻿Dieter ﻿and ﻿his ﻿team ﻿of ﻿assistants/PhD ﻿students ﻿was ﻿guaranteed ﻿by ﻿Klaus, ﻿who ﻿kindly ﻿permitted ﻿the ﻿transfer ﻿of ﻿the ﻿whole ﻿material ﻿to ﻿Ulm. ﻿Nevertheless, ﻿Klaus ﻿continued ﻿to ﻿participate ﻿in ﻿our ﻿studies ﻿in ﻿various ﻿ways, ﻿discussing ﻿matters ﻿with ﻿us ﻿or ﻿supporting ﻿our ﻿work ﻿in ﻿many ﻿ways. ﻿For ﻿example, ﻿in ﻿2001 ﻿he ﻿financed ﻿a ﻿costly ﻿trip ﻿of ﻿Andreas ﻿Braun ﻿and ﻿Dieter ﻿to ﻿Siberia ﻿to ﻿collect ﻿more ﻿Orsten-type ﻿rock, ﻿a ﻿superb ﻿expedition, ﻿but ﻿scientifically ﻿unsuccessful ﻿adventure. ﻿In ﻿1997 ﻿Andreas ﻿Maas, ﻿born ﻿in ﻿the ﻿same ﻿small ﻿town ﻿Kellinghusen ﻿as ﻿Dieter, ﻿joined ﻿in, ﻿starting ﻿to ﻿work ﻿on ﻿the ﻿larval ﻿cycle ﻿of ﻿the ﻿Krill ﻿(Euphausia ﻿superba) ﻿and ﻿the ﻿phylogeny ﻿of ﻿euphausiids ﻿as ﻿the ﻿topic ﻿of ﻿his ﻿diploma ﻿work. ﻿The ﻿real ﻿comeback ﻿of ﻿'Orsten' ﻿research ﻿took ﻿some ﻿more ﻿years, ﻿after ﻿Dieter ﻿received ﻿a ﻿DFG ﻿grant ﻿for ﻿Andreas ﻿to ﻿investigate ﻿the ﻿huge ﻿material ﻿of ﻿Phosphatocopina ﻿as ﻿his ﻿doctoral ﻿thesis. ﻿The ﻿results ﻿were ﻿published ﻿in ﻿2003 ﻿as ﻿our ﻿fifth ﻿monograph ﻿in ﻿Fossils ﻿and ﻿Strata. ﻿Subsequently ﻿Dieter ﻿hired ﻿Andreas ﻿as ﻿his ﻿research ﻿assistant, ﻿the ﻿collaboration ﻿lasting ﻿until ﻿shortly ﻿before ﻿the ﻿end ﻿of ﻿the ﻿section ﻿and ﻿retirement ﻿of ﻿Dieter ﻿in ﻿2016, ﻿when ﻿Andreas ﻿had ﻿to ﻿leave ﻿because ﻿of ﻿"governmental ﻿rules". ﻿in ﻿the ﻿frame ﻿of ﻿a ﻿DFG-funded ﻿joint ﻿venture ﻿of ﻿German ﻿and ﻿Chinese ﻿scientists ﻿Dieter ﻿and ﻿Andreas ﻿underwent ﻿several ﻿trips ﻿to ﻿China ﻿between ﻿2002 ﻿and ﻿2005, ﻿collaborating ﻿with ﻿Jun-yuan ﻿Chen ﻿on ﻿Chengjiang ﻿fossils. ﻿Besides ﻿jointly ﻿produced ﻿papers ﻿on ﻿such ﻿material, ﻿also ﻿more ﻿papers ﻿appeared ﻿on ﻿'Orsten' ﻿fossils. ﻿In ﻿2008 ﻿Andreas ﻿successfully ﻿finished ﻿his ﻿habilitation ﻿and ﻿in ﻿2010 ﻿received ﻿the ﻿honourable ﻿degree ﻿of ﻿an ﻿"extraordinary ﻿professor" ﻿by ﻿the ﻿university ﻿of ﻿Ulm. ﻿Exploration ﻿of ﻿new ﻿'Orsten' ﻿occurrences ﻿outside ﻿Sweden ﻿progressed ﻿with ﻿finds ﻿in ﻿Poland ﻿(Walossek ﻿& ﻿Szaniawski ﻿1988), ﻿Canada ﻿(paper ﻿published ﻿by ﻿Roy ﻿and ﻿Fåhræus ﻿on ﻿tiny ﻿larvae, ﻿which ﻿Klaus ﻿and ﻿Dieter ﻿had ﻿described ﻿as ﻿type-A ﻿larvae ﻿in ﻿1986), ﻿and ﻿Australia ﻿(Walossek ﻿et ﻿al. ﻿1993). ﻿Also ﻿an ﻿exceptional ﻿find ﻿of ﻿muscle ﻿preservation ﻿in ﻿'Orsten' ﻿fossils, ﻿pentastomids, ﻿by ﻿Dietmar ﻿Andres ﻿was ﻿of ﻿significance, ﻿until ﻿now, ﻿however, ﻿the ﻿only ﻿report ﻿of ﻿internal ﻿structures ﻿(Andres ﻿1989). ﻿Regrettably ﻿more ﻿material, ﻿though ﻿collected ﻿by ﻿Andres, ﻿was ﻿never ﻿published. ﻿In ﻿1995 ﻿we ﻿published ﻿a ﻿short ﻿report ﻿on ﻿the ﻿finds ﻿of ﻿'Orsten'-type ﻿preserved ﻿fossils ﻿in ﻿the ﻿little ﻿rock ﻿pieces ﻿from ﻿Siberia, ﻿but ﻿which ﻿were ﻿still ﻿awaiting ﻿a ﻿detailed ﻿publication. ﻿And ﻿in ﻿2001 ﻿finds ﻿of ﻿few ﻿early ﻿instars ﻿of ﻿a ﻿phosphatocopid ﻿were ﻿reported ﻿from ﻿Great ﻿Britain. ﻿All ﻿this ﻿demonstrated ﻿the ﻿possibility ﻿of ﻿discoveries ﻿also ﻿outside ﻿Sweden, ﻿but ﻿systematic ﻿investigations, ﻿as ﻿in ﻿Sweden ﻿remained ﻿a ﻿hope. ﻿All ﻿other ﻿finds ﻿were ﻿isolated ﻿finds ﻿of ﻿one ﻿to ﻿few ﻿specimens. ﻿Therefore, ﻿the ﻿extended ﻿field ﻿trip ﻿to ﻿the ﻿tundra ﻿of ﻿north ﻿eastern ﻿Siberia ﻿(Olenek ﻿river ﻿area ﻿south ﻿of ﻿the ﻿Lena ﻿delta) ﻿by ﻿Dieter ﻿and ﻿Andreas ﻿Braun ﻿in ﻿2001 ﻿(above) ﻿aimed ﻿at ﻿bringing ﻿up ﻿many ﻿more ﻿fossils ﻿from ﻿there ﻿by ﻿collecting ﻿much ﻿more ﻿material ﻿from ﻿a ﻿successful ﻿locality. ﻿We ﻿collected ﻿about ﻿100 ﻿kg ﻿of ﻿rock ﻿material ﻿and ﻿took ﻿it ﻿back ﻿to ﻿Germany, ﻿but ﻿the ﻿large ﻿material ﻿did ﻿not ﻿yield ﻿a ﻿single ﻿specimen! ﻿Lastly, ﻿also ﻿our ﻿investigations ﻿in ﻿China, ﻿i.e. ﻿the ﻿ones ﻿of ﻿Andreas ﻿Braun, ﻿Andreas ﻿Maas ﻿and ﻿Dieter, ﻿also ﻿aiming, ﻿at ﻿least ﻿in ﻿part, ﻿to ﻿find ﻿'Orsten'-type ﻿fossils ﻿from ﻿there, ﻿failed, ﻿although ﻿initially ﻿promising ﻿because ﻿of ﻿discoveries ﻿of ﻿phosphatic ﻿early ﻿embryonic ﻿stages ﻿= ﻿cleavage ﻿stages ﻿with ﻿two ﻿cells ﻿to ﻿blastomeric ﻿stages ﻿preserved ﻿from ﻿the ﻿late ﻿Precambrian. ﻿Yet, ﻿these ﻿are ﻿primarily ﻿phosphatized, ﻿and ﻿all ﻿efforts ﻿to ﻿find ﻿'Orsten'-type ﻿fossils ﻿were ﻿unsuccessful. ﻿In ﻿2003 ﻿Martin ﻿Stein, ﻿palaeontology ﻿student ﻿from ﻿the ﻿university ﻿of ﻿Marburg, ﻿joined ﻿our ﻿tea ﻿for ﻿one ﻿year ﻿to ﻿work ﻿on ﻿'Orsten' ﻿material ﻿and ﻿helped ﻿also ﻿in ﻿the ﻿China ﻿project. ﻿First ﻿using ﻿modelling ﻿clay ﻿for ﻿the ﻿production ﻿of ﻿models, ﻿which ﻿we ﻿also ﻿animated ﻿by ﻿combining ﻿a ﻿series ﻿of ﻿pictures, ﻿Martin ﻿was ﻿the ﻿first ﻿to ﻿start ﻿with ﻿3D ﻿modelling ﻿using ﻿the ﻿open-source ﻿program ﻿Blender ﻿(see ﻿chapter ﻿Methods). ﻿He ﻿could ﻿even ﻿animate ﻿the ﻿model ﻿in ﻿a ﻿nice ﻿and ﻿persuasive ﻿manner. ﻿Another ﻿highlight ﻿was ﻿a ﻿trip ﻿in ﻿2004 ﻿of ﻿Dieter, ﻿Andreas ﻿Braun ﻿and ﻿Martin ﻿Stein ﻿as ﻿our ﻿translator, ﻿to ﻿Öland ﻿and ﻿Västergötland ﻿(Falbygden ﻿and ﻿Kinnekulle), ﻿where ﻿we ﻿met ﻿John ﻿Ahlgren, ﻿amateur ﻿palaeontologist ﻿and ﻿expert ﻿of ﻿the ﻿Kinnekulle ﻿area ﻿and ﻿its ﻿fossils ﻿sites, ﻿who ﻿gave ﻿us ﻿some ﻿rock ﻿material ﻿for ﻿processing ﻿(no ﻿results ﻿regrettably). ﻿For ﻿us, ﻿2005 ﻿was ﻿the ﻿beginning ﻿of ﻿a ﻿new ﻿period, ﻿when ﻿we ﻿founded ﻿the ﻿international ﻿C.O.R.E. ﻿group ﻿of ﻿people ﻿interested ﻿in ﻿the ﻿'Orsten' ﻿and ﻿research ﻿on ﻿it. ﻿For ﻿long ﻿we ﻿had ﻿thought ﻿of ﻿something ﻿like ﻿possibilities ﻿to ﻿expand ﻿our ﻿workgroup ﻿aiming ﻿at ﻿a ﻿concentration ﻿of ﻿expertise ﻿and ﻿the ﻿possible/hopefully ﻿even ﻿exploration ﻿of ﻿new ﻿sites, ﻿but ﻿this ﻿was ﻿pure ﻿theory, ﻿and ﻿we ﻿could ﻿immediately ﻿attract ﻿eventually ﻿about ﻿30 ﻿colleagues ﻿from ﻿various ﻿disciplines ﻿and ﻿from ﻿nine ﻿nations, ﻿spanning ﻿from ﻿the ﻿U.S.A., ﻿UK, ﻿Danmark, ﻿France, ﻿Germany, ﻿and ﻿Sweden ﻿to ﻿Poland, ﻿China ﻿and ﻿Japan ﻿to ﻿join ﻿in. ﻿The ﻿principle ﻿ideas ﻿(objectives) ﻿of ﻿the ﻿group ﻿were ﻿to ﻿combine ﻿skills ﻿and ﻿expertise, ﻿to ﻿train ﻿youngsters ﻿and ﻿to ﻿help ﻿each ﻿other ﻿in ﻿the ﻿research ﻿on ﻿'Orsten' ﻿and ﻿related ﻿issues. ﻿At ﻿least ﻿some ﻿of ﻿the ﻿aspects ﻿could ﻿be ﻿initiated ﻿or ﻿put ﻿into ﻿reality ﻿until ﻿the ﻿time ﻿of ﻿the ﻿official ﻿end ﻿in ﻿2016. ﻿Even ﻿better, ﻿or ﻿most ﻿importantly, ﻿exciting ﻿new ﻿'Orsten' ﻿material ﻿was ﻿brought ﻿up ﻿by ﻿the ﻿Chinese ﻿C.O.R.E. ﻿members ﻿Dong ﻿Xi-ping ﻿and ﻿Zhang ﻿Xi-guang, ﻿and ﻿also ﻿Huaqiao ﻿Zhang, ﻿who ﻿discovered ﻿'Orsten' ﻿3D ﻿arthropods ﻿in ﻿different ﻿localities ﻿in ﻿China, ﻿even ﻿kindly ﻿allowing ﻿us ﻿to ﻿collaborate ﻿with ﻿them. ﻿Noteworthy ﻿that ﻿also ﻿from ﻿Poland ﻿more ﻿material ﻿was ﻿etched ﻿by ﻿Ewa ﻿Olempska. ﻿Collaborations ﻿yielded ﻿several ﻿nice ﻿papers ﻿and ﻿increased ﻿the ﻿publicity ﻿of ﻿the ﻿'Orsten' ﻿significantly. ﻿During ﻿that ﻿time, ﻿we ﻿were ﻿happy ﻿to ﻿recruit ﻿colleagues ﻿like ﻿the ﻿palaeontologists ﻿Nigel ﻿Hughes ﻿and ﻿John ﻿Repetski, ﻿and ﻿the ﻿zoologist ﻿and ﻿Low-Reynolds ﻿specialist ﻿and ﻿high-speed ﻿cinematographer ﻿Rudi ﻿Strickler ﻿from ﻿the ﻿U.S.A. ; ﻿David ﻿Siveter, ﻿Mark ﻿Williams, ﻿Tom ﻿Harvey, ﻿Phil ﻿Donoghue ﻿and ﻿Euan ﻿Clarkson, ﻿UK, ﻿well-known ﻿palaeontologists ﻿(David ﻿worked ﻿on ﻿various ﻿Palaeozoic ﻿forms, ﻿including ﻿the ﻿3D-preserved ﻿phosphatocopine ﻿from ﻿Comley, ﻿UK; ﻿Euan ﻿has ﻿been ﻿working ﻿for ﻿long ﻿on ﻿trilobites ﻿from ﻿the ﻿Swedish ﻿alum ﻿shales); ﻿Phil ﻿added ﻿his ﻿expertise ﻿on ﻿embryo ﻿fossils, ﻿mainly ﻿nemathelminths); ﻿from ﻿Copenhagen, ﻿Danmark ﻿Jens ﻿Høeg, ﻿Jørgen ﻿Olesen, ﻿working ﻿on ﻿crustaceans, ﻿Martin ﻿Stein, ﻿Bo ﻿Rasmussen, ﻿and ﻿Reinhardt ﻿Kristensen ﻿working ﻿on ﻿minute ﻿animals ﻿like ﻿tardigrades; ﻿from ﻿Germany ﻿Jason ﻿Dunlop, ﻿palaeontologist ﻿and ﻿chelicerate ﻿specialist, ﻿Michael ﻿Steiner, ﻿Georg ﻿Mayer, ﻿zoologist, ﻿and ﻿Wolfgang ﻿Böckeler, ﻿pentastomid ﻿specialist; ﻿from ﻿Sweden ﻿John ﻿Ahlgren, ﻿Mats ﻿Eriksson ﻿and ﻿Frederik ﻿Terfelt; ﻿from ﻿Poland ﻿Ewa ﻿Olempska; ﻿from ﻿France: ﻿Lean ﻿Vannier; ﻿from ﻿Japan ﻿Gengo ﻿Tanaka ﻿and ﻿Haryoshi ﻿Maeda; ﻿from ﻿China ﻿Dong ﻿Xi-ping, ﻿Xi-guang ﻿Zhang, ﻿Huaqiao ﻿Zhang, ﻿Liu ﻿Zheng ﻿and ﻿Yu ﻿Liu. ﻿From ﻿the ﻿Ulm ﻿team: ﻿Andreas ﻿Maas, ﻿the ﻿entire ﻿family ﻿Haug, ﻿Christopher ﻿Castellani, ﻿and ﻿me; ﻿and ﻿our ﻿honorary ﻿member ﻿Klaus ﻿Müller ﻿of ﻿course. ﻿Already ﻿the ﻿first ﻿few ﻿months ﻿of ﻿Joachim's ﻿in-depth ﻿investigations ﻿indicated ﻿that ﻿new ﻿things ﻿could ﻿to ﻿be ﻿expected. ﻿Indeed ﻿his ﻿effort ﻿and ﻿enthusiasm ﻿led ﻿to ﻿a ﻿much ﻿better ﻿insight ﻿of ﻿the ﻿ontogeny ﻿of ﻿stem ﻿crustaceans, ﻿corrected ﻿various ﻿views ﻿based ﻿on ﻿our ﻿previously ﻿incomplete ﻿and, ﻿partly ﻿rough ﻿study ﻿from1990. ﻿The ﻿increased ﻿background ﻿in ﻿arthropods ﻿and ﻿the ﻿theory ﻿of ﻿Phylogenetic ﻿Systematic ﻿of ﻿all ﻿of ﻿us ﻿also ﻿helped ﻿much. ﻿Furthermore, ﻿Joachim's ﻿intensive ﻿studies ﻿of ﻿the ﻿larval ﻿cycles, ﻿morphogenetic ﻿changes ﻿and ﻿the ﻿3D ﻿reconstructions ﻿(with ﻿Blender), ﻿initiated ﻿by ﻿Martin, ﻿brought ﻿us ﻿much ﻿forward ﻿in ﻿a ﻿better ﻿way ﻿of ﻿comparing ﻿the ﻿different ﻿taxa ﻿and ﻿to ﻿make ﻿comparisons ﻿with ﻿extant ﻿counterparts ﻿in ﻿terms ﻿of ﻿relationships ﻿or ﻿morphological/ecological ﻿similarities. ﻿Ontogenetic ﻿series ﻿as ﻿3D ﻿models ﻿and ﻿through ﻿time ﻿were ﻿then ﻿called ﻿4D, ﻿created ﻿by ﻿Joachim. ﻿More ﻿will ﻿be ﻿added ﻿step ﻿by ﻿step. ﻿&squf; ﻿2016, ﻿first ﻿paper ﻿together ﻿with ﻿our ﻿colleague ﻿Huaqiao ﻿Zhang, ﻿who ﻿continued ﻿collaboration ﻿with ﻿us ﻿until ﻿now. ﻿Two ﻿sad ﻿events ﻿need ﻿to ﻿be ﻿added. ﻿One ﻿and ﻿a ﻿severe ﻿drawback ﻿was ﻿that ﻿Dieter ﻿was ﻿diagnosed ﻿prostate ﻿cancer ﻿in ﻿May ﻿2007, ﻿which ﻿forced ﻿him ﻿to ﻿be ﻿operated, ﻿with ﻿radiation ﻿treatment ﻿from ﻿October ﻿to ﻿December. ﻿The ﻿problem ﻿remained, ﻿however, ﻿and ﻿a ﻿further ﻿operation ﻿and ﻿radiation ﻿treatment ﻿followed ﻿in ﻿2013 ﻿followed. ﻿ ﻿ ﻿The ﻿second ﻿one ﻿was ﻿that ﻿our ﻿colleague ﻿Klaus ﻿J. ﻿Müller ﻿died ﻿peacefully ﻿in ﻿February ﻿12, ﻿2010, ﻿age ﻿87. ﻿With ﻿Klaus ﻿we ﻿really ﻿lost ﻿the ﻿most ﻿important ﻿person ﻿having ﻿worked ﻿on ﻿the ﻿'Orsten', ﻿even ﻿more ﻿a ﻿personal ﻿friend. ﻿Thank ﻿you ﻿Klaus ﻿for ﻿inspiring ﻿us ﻿to ﻿keep ﻿up ﻿with ﻿science ﻿of ﻿its ﻿purest ﻿kind. ﻿&squf; ﻿publication ﻿of ﻿Christopher's ﻿work ﻿on ﻿cyanobacterians ﻿in ﻿2018. The Big Five: Monographies published in Fossils & Strata between 1985 and 2003.